It sounds amazing, don't get me wrong. But more often than not, "free" in the marketing world means "free for now," or "free until you need to connect it, or send something, or actually use the damn thing." Honestly, this article was originally going to be 30 free marketing tools. That was the goal I set myself. But something happened as I was writing: my research revealed that many of those 30 free marketing tools weren't actually free. They were kinda free. Freeish. The 15 marketing tools in this post aren't freeish. They're free. Forever. They cover three categories of business growth: increasing brand awareness, increasing sales, and increasing efficiency. And many of them you won't have heard of because their paid competitors have more money - more marketing budget. So they've gone free to stand out. And that's where your business can cash in to grow, succeed, and drive sales. The free tools in this section can help our business stand out and get seen. Focused on content creation, brand promotion and top of funnel marketing strategies, these tools are free forever, and just need you to signup. 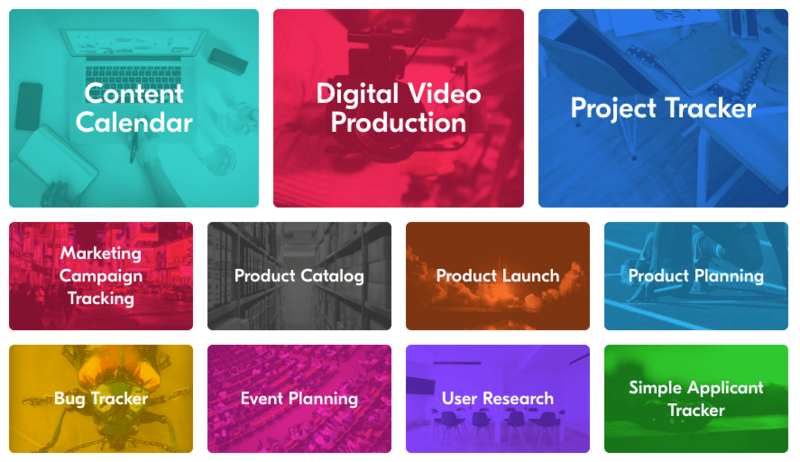 Soapbox enables marketers to quickly and easily create videos with a face-cam and screencapture at the same time. 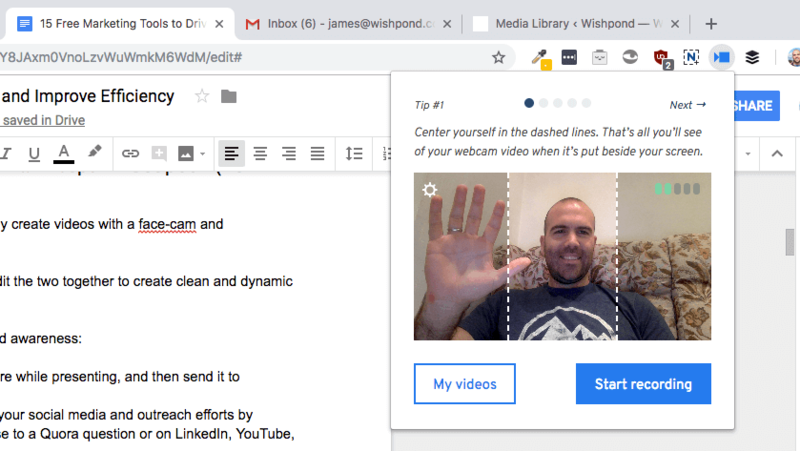 Attaching to your browser as a plugin, the tool captures both your face and your screen, then makes it easy to edit the two together to create clean and dynamic video content. For brand awareness, it enables you to boost your social media and outreach efforts by making it easy to create quick videos in response to a Quora question or on LinkedIn, YouTube, Facebook or Instagram. With the recent explosion in video, any tool that makes production easier gets an A+ in my books. Every list like this one mentions Canva, and it's a great tool, don't get me wrong. But you've already heard of it. And we want to avoid the tools you already know. 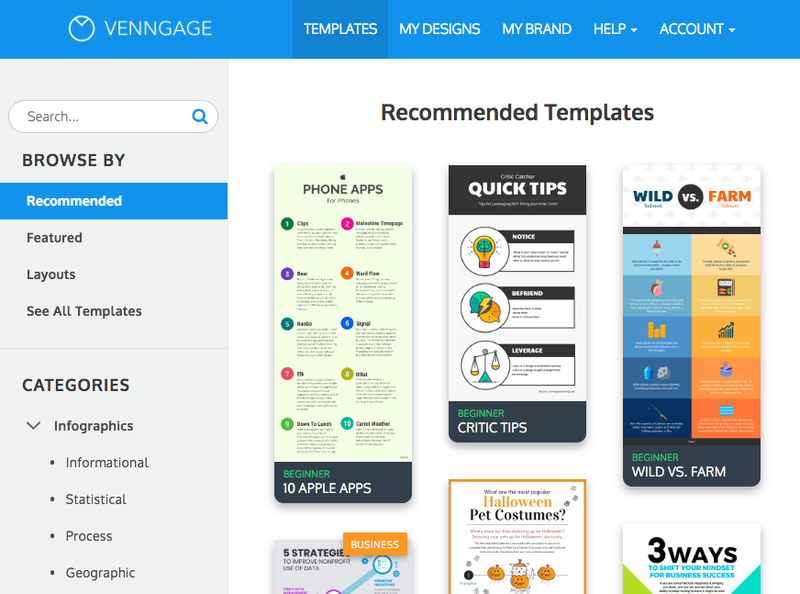 And anyway, I've recently been loving a different free visual design tool: Venngage. Venngage makes infographic creation super easy, and it's a tall order. Infographics are, notoriously, the most difficult type of content to create as a non-designer. And yet, infographics can increase web traffic by up to 12%, so… they're worth the effort. Especially when a tool like Venngage makes it easy. OneSignal is the free tool Wishpond uses to collect and send push notifications to blog readers. People receive a notification through their browser when we publish a new blog article or feature. OneSignal enables us to prompt visitors to opt in, but not require an email address. This results in increased subscription rates, but lowers the value of leads. For us, driving traffic to our blog increases brand awareness and trust - which is (at the early stage) a more valuable thing than the ability to email someone. I'm not talking about using Slack as an internal communication platform. Instead, (and the reason this is in the "brand awareness" section) my recommendation is to get involved in Slack communities. 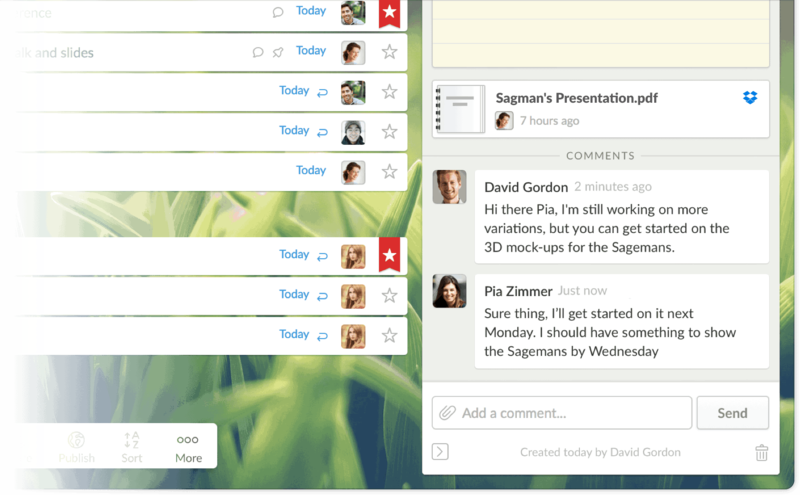 Slack communities offer your business a network of like-minded marketers. And those marketers know other marketers. And, if you ask kindly and appropriately, those marketers may just share your business with the world. Slack has a free plan, which every marketer should be on, as well as a paid plan charging $10/user. The tools in this section are focused entirely on sales strategies: turning visitors into leads and sales, communicating with prospective customers, optimizing your website, etc. 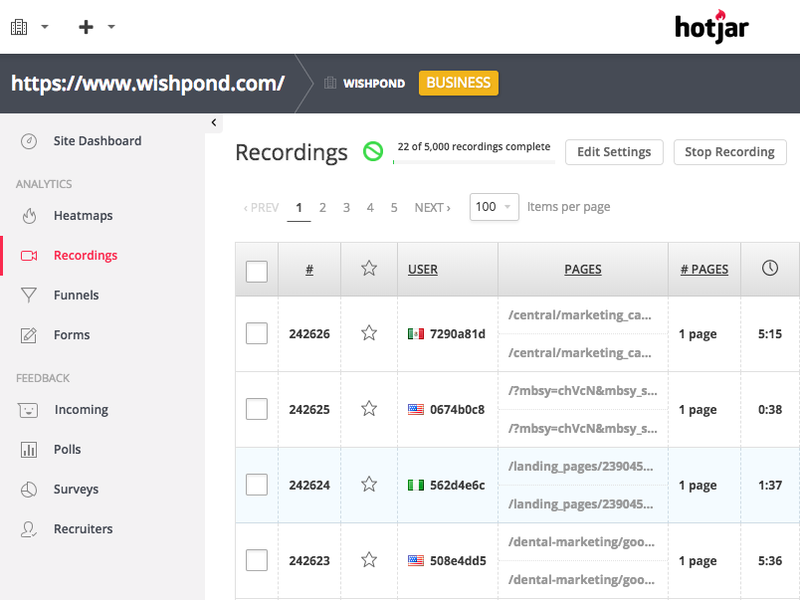 Wishpond is, typically, a paid platform. But last year we opened up a bit, enabling marketers to add our popups, welcome mats and opt-in bars to their website completely free. 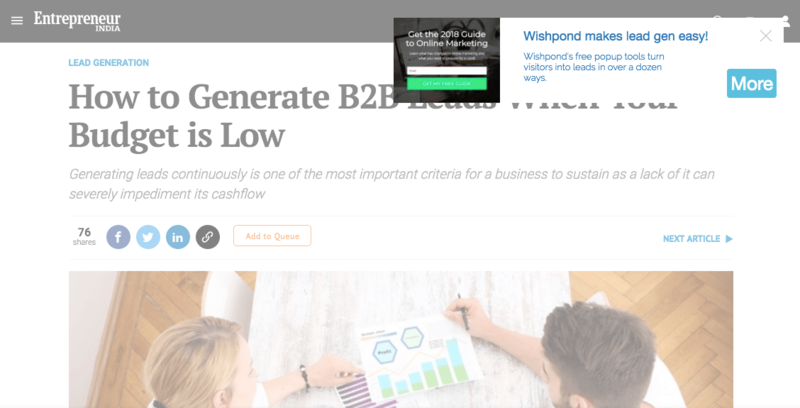 Wishpond's popups, welcome mats and opt-in bars give you dozens of new ways to turn visitors into leads and sales. And every lead you get can be nurtured into a sale with Wishpond's email platform or through one of our many integrations. Check out Wishpond's free website optimization plugins and sign up through that product page. Otherwise you'll be sent through our paid signup flow. Tidio Live Chat offers (as you might expect) free live chat software. 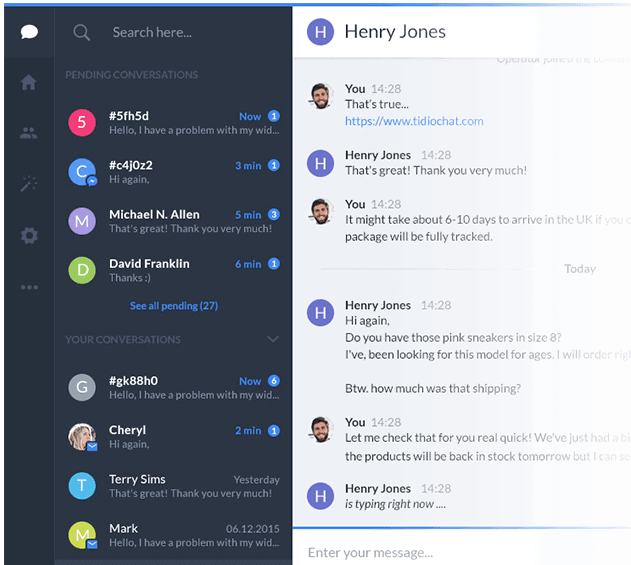 Their free tools enable your early-stage business to connect with your website visitors: answer questions, send relevant information, and (here's a cool one) continue a conversation on Facebook messenger that was started on your website. They also integrate with most email tools and enable you to track visitors and export data. The primary restriction on their free plan is number of users (3). But $30/month will give you automation (such as auto-reply or abandoned cart messaging). 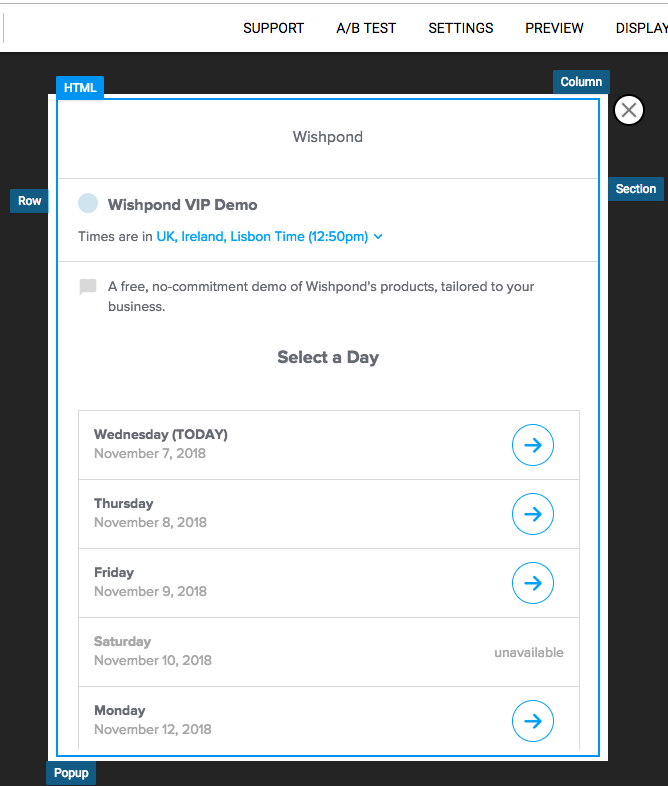 Wishpond uses Calendly to coordinate all our demo bookings. And, while we're on a paid plan, their "Free Forever" plan is great for early-stage businesses. They don't have any limitation on the number of bookings or events. Instead, the limit is on a single "type of event," and (of course) includes Calendly branding. The free plan also includes event notifications and calendar integrations with Google Calendar, Office 365, Outlook and iCloud. 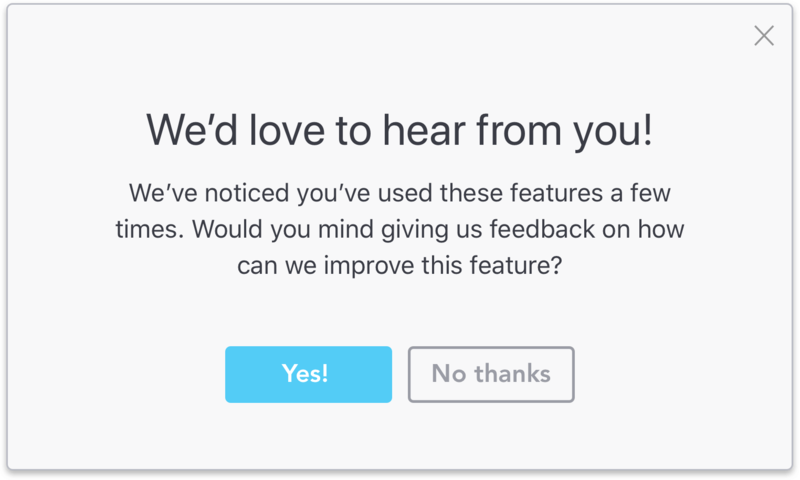 Pendo enables marketers to add NPS surveys to their websites for free, and automatically update a Slack channel with the responses, scores and feedback. It's the tool we've been using to track our customer satisfaction and customer support campaigns for the past 18 months. Better understanding your customer's satisfaction means you can address deficiencies, reward excellence, and (in general) make your business a more profitable one. Pendo's paid plans to substantially more than the free one (analytics, for instance), but if all you need is some early-stage customer insight, it's a great tool to get you started. Content curation is a crucial part of social media and inbound marketing. The challenge, of course, is that when you send anyone to a website not your own, you lose them to that website. Luckily, Exitbar.io enables marketers to add a call-to-action to every link they share, meaning you can send people to an article on Entrepreneur or Forbes while still leaving your brand front and center. Exitbar is available for free, but they "reserve right to display our own button on up to 1% of generated traffic." There used to be a few free tools which did something very similar to Exitbar, but they've all removed their free plans in the past few months. HotJar's "free forever" plan covers businesses with up to 2,000 pageviews per day (which is pretty generous, as far as free plans go). Hotjar records clicks, scrolls and time-on-page in their heatmapping tool, and records user sessions as well. They send you daily recordings via email, and recordings can be searched via date range, url, visit duration and more. 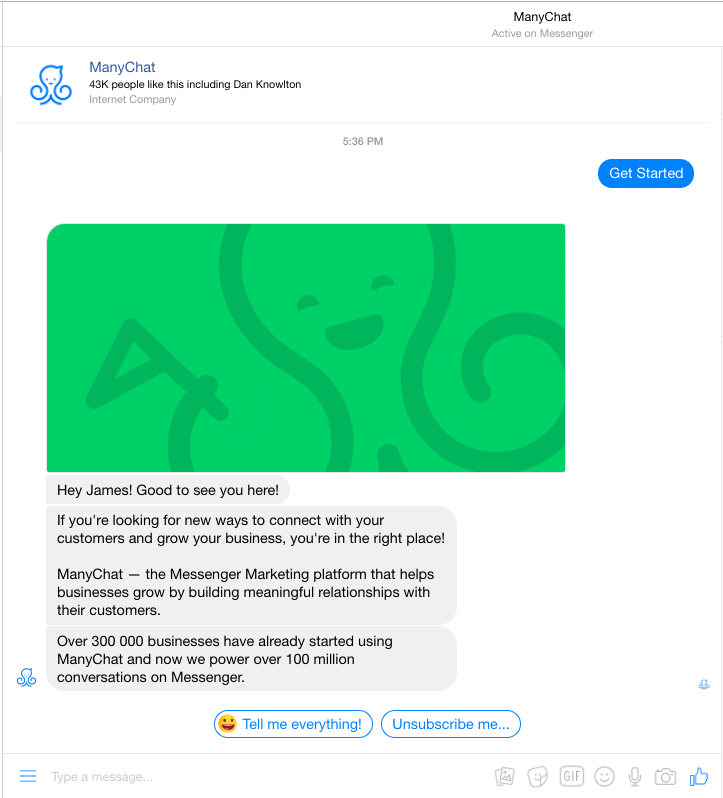 ManyChat is our go-to free tool for creating Facebook messenger bots - which have quickly become one of the most innovative ways to connect with your prospective customers. The coolest way we've been using ManyChat is with Facebook Ads, where we can set the "objective" of the ad campaign to be connecting on a Facebook message. Then, the bot takes over to start the conversation and deliver relevant information to prospective customers (even if no real person is awake). Marketing online can be frustratingly time-consuming, but the majority of automation or project management tools are expensive and complicated. The tools in this section help you accomplish your marketing responsibilities more easily, more quickly, and with less fuss. On first glance, Ulysses seems to do exactly what Google Docs does. That ability - to transform basic text into beautiful PDFs, as well as publish directly to Wordpress - helps this free marketing tool to stand out in a space dominated by Google. Crucial to connecting many of these free marketing tools together, Zapier is an invaluable sales tool. For instance, being able to update your Airtable projects when you complete or change something in the Wunderlist app makes both tools more effective. Connecting Wishpond to Google Sheets, so every time you get a new Wishpond lead it updates a in Sheets. Connecting Pendo to Slack, so every time someone fills out your NPS form, you're notified in a specific Slack channel (enabling you to reply or follow up). Connecting Calendly to Slack or Gmail, so you're notified when someone books a demo. Wunderlist is the leading organizational app for marketers - making it simple to keep track of your responsibilities, campaigns and content from any device. Wunderlist coordinates deadlines, allows you to share, comment, and work collaboratively and organize your work into shared folders. 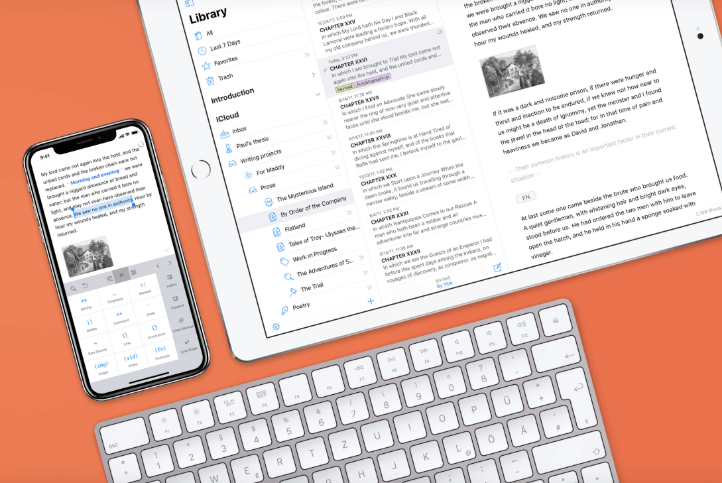 "Available for free on iPhone, iPad, Mac, Android, Windows, Kindle Fire and the Web, Wunderlist works seamlessly across all major devices to keep your life in sync." A cool way to use Wunderlist is in conjunction with a platform like Airtable, Asana or Trello (your project management software). These platforms aren't optimized for mobile, so integrating the two together (with a platform like Zapier) enables you to organize your marketing life wherever and whenever you are. Airtable is a project management tool built around three major display types: sheet, calendar and gallery. So whatever project you're working on, they have a display format which works. 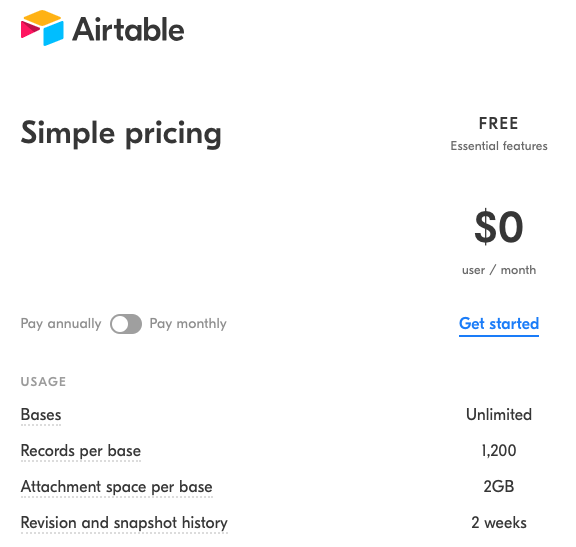 That, coupled with the templates and the fact that you can insert any content type (attachments, notes, checkboxes, barcodes, etc) and connect it to any other project you like, makes Airtable a strong contender to its larger competitors. Plus, they're free forever plan is awesome. Hopefully there's a few free marketing tools in here which have caught your eye. There's so much to do in marketing, and these tools provide such a wide spectrum of answers, it may be a bit intimidating. So if you have any questions about how we use these tools (because we use almost all of them ourselves), don't hesitate to reach out in the comment section. I'd love to talk tools!